We create the scene by starting with a USD file with static geometry, referencing it into another USD file, overlaying animation, and then using a third USD file to reference and re-time that animation. To fully illustrate these concepts, we walk through a Python script that performs these steps using the Python USD API, as well as showing the resulting text USDA outputs. The scripts and data files exist in the USD distribution under USD/extras/usd/tutorials/animatedTop. Run generate_examples.py in that directory to generate all of the snippets for each step shown below. Computer graphics pipelines almost always pick an axis to represent the "up" direction. Common choices are +Y and +Z. As a pipeline interchange format, USD provides ways to configure a site default, as well as to store an explicit choice per-file. See Encoding Stage UpAxis for details. In the examples here, we use +Z as the up axis, and write this choice out in every file so that they will work regardless of your site configuration. Let's make the top spin. In a typical production pipeline, rigging & animation would be set up in a dedicated package and the results exported to USD. Here, we will create the USD files by hand to illustrate the underlying concepts. # "Transformations, Time-sampled Animation, and Layer Offsets". # directory that illustrate each of the steps in the tutorial. "Step 1: Start and end time codes"
You can run usdview on this file, but the viewport will be mostly empty since we haven't added any geometry. This adds a "Top" prim to our scene, with the details referenced in from the geometry file. You may have noticed the 'prepend' operation in the reference statement above. 'Prepend' means that, when this layer is composed with others to populate the stage, the reference will be inserted before any references that might exist in weaker sublayers. This ensures that the contents of the reference will contribute stronger opinions than any reference arcs that might exist in other, weaker layers. In other words, 'prepend' gives the inuitive result you'd expect when you apply one layer on top of another. This is what the UsdReferences API will create by default. You can specify other options with the position parameter, but this should rarely be necessary. Next, let's add animation overrides to make the top spin. "Step 3: Adding spin animation"
UsdGeomXformable uses the name of the attribute to encode its meaning. 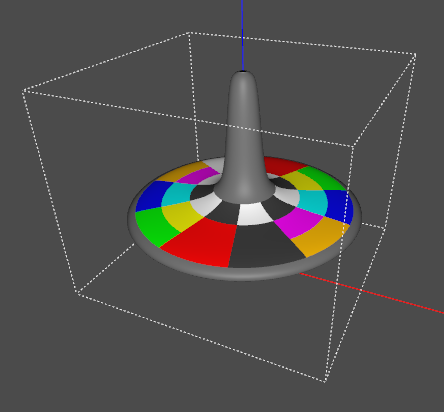 Here, the rotateZ part specifies a rotation on the Z axis, and spin is a descriptive suffix. There are similar names for related transformation operations; see the UsdGeomXformable schema for details. Even though there is only a single transform at the moment, to make it take effect we must express the desired order as the xformOpOrder attribute. USD applies a linear interpolation filter to reconstruct the attribute value from the time samples. Rotations are expressed in degrees, so this provides 4 revolutions over the course of the 192-frame animation. One way to think about xformOpOrder is that it describes a series of transformations to apply relative to the local coordinate frame, in order. Tilt the top, then spin it on its tilted axis. "Step 5: Adding precession and offset"
To summarize: we used time-samples to animate the motion, and careful ordering of the transformations to express a spinning motion with precession and translation in a relatively simple way. USD uses linear interpolation to reconstruct the intermediate values of the operations and then computes the combined transformation. In the scenes above we referenced the static geometry before adding animation, but it is also possible to reference a file containing its own animation. While referencing animation, a layer offset can be used to apply a simple scale & offset operation to the timeline. Here we reference the above animation in 3 times, adding a different +X translation to each. The first top has no layer offset; the second has a +96 frame offset (causing it to be 180 degrees out of phase), and the third top has a scale of 0.25 (causing its animation to play back at 4x the rate). "Step 6: Layer offsets and animation"
A layer offset (represented as SdfLayerOffset) expresses both a scale and offset that is applied to the times of the samples when bringing the data from the layer to the stage. For a given sample, stageTime = layerTime * scale + offset. The middle top, with the offset of +96, does not begin rotating until 96 frames after the left top (which has no offset). The reason is that USD does not extrapolate time-samples. Outside the time range covered by samples, the nearest sample value is held. In this case, it takes 96 frames until we hit the first sample and rotation begins. The right top spins quickly (4x the rate) and then stops. The 0.25 scale on its reference has "shrunk down" its timeline, so it quickly plays through. After the first 48 frames (== 192 frames * 0.25), there are no further time samples, so again the values are held and rotation stops. To lay out the tops in a row, we used a parent Xform prim on each, and set the translate there. If we had referenced the Top in directly and added the translate to xformOpOrder, we would be at risk of replacing (or otherwise falling out of sync with) the underlying xformOpOrder and losing its animation. By using a separate pivot we avoid this. It's worth noting, however, that in a production pipeline most assets do not contain animated root transforms, and so this is not necessary. When adding the references, we had to specify the primPath. This is because we did not set the defaultPrim metadata when creating Step5.usda; if we had done that, the primPath would not be required. To summarize, layer offsets are intended to support simple cases of retiming animation. For more elaborate scenarios, such as looping animations, USD supports the more powerful (and correspondingly more complex) concept of Value Clips. We conclude this tutorial with a path-traced render of the above scene, which illustrates how the varying rates of rotation yield corresponding degrees of motion blur. All content on this site © Disney/Pixar, All Rights Reserved. "Universal Scene Description," "PIXAR," "PRESTO" and the "PRESTO" logo are trademarks of Pixar Animation Studios.